all that without a database, in plain php and without a lot of funny but complicating "features"
The gallery thing was the real goal, because I like to show holiday pictures to my friends. So I started with nearly no expierence on cms programming, yet some years of professional administrating some "drupal"-based websites with webshops and all this stuff. 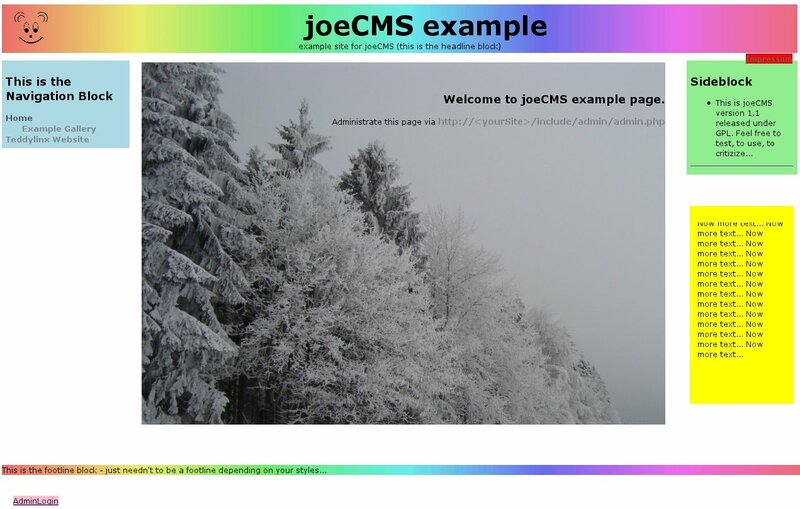 And so joeCMS is a php exercise course for me too. I will be glad, if someone uses this. If not - no problem either. I'm using it. That's enough for me. There are 2 elements more: links for the impressum (red) and for the admin's login (pink). Headline, sideblock, footline, ticker and content area are showing simple html or php content, there are no limitations at all(!). All content is read by specific modules. As all elements are styled in a central stylesheet, simple plain text can be used as content as well. Administration is done by one php program, which allows you to change the configuration data, change the menu and the content, upload and delete files and edit the styles and element blocks. In addition there is a block type named "ticker" which is an independent block element but may be a page block too. That's because the ticker data is stored in a page - ticker.page and you can - if you want - link this page in the usual menu too. By appropriete setting of the corresponding CSS styles you can have 2 different views of the same content. the right to protect subdirs - usually with the .htaccess method, see A word on security for further information on this topic. Then change to the "include" subdirectory and there deeper into the "admin" subdirectory. Here lies the central configuration file "cms.config". Open it with your favorite text editor and edit the line Site="http://localhost/..." Simply replace the site uri with that of your intended webspace location. Usual that shall be something like Site="www.mydomain.tld" If you want to test joecms in a subdirectory of your webspace, you can do it by simply mentioning it here: Site="www.mydomain.tld/subdirectory" Then save this file. 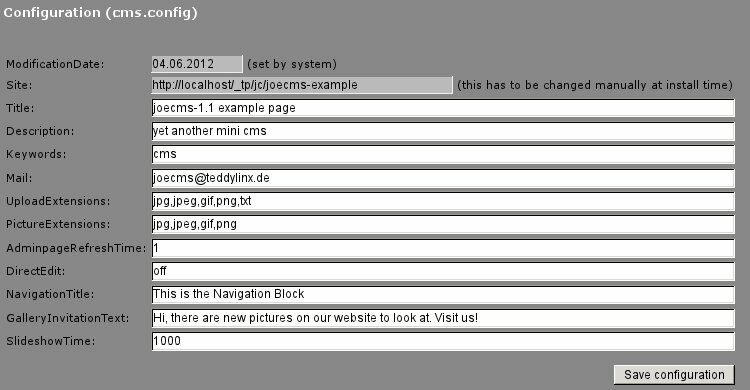 Now upload the directories and files beneath "joecms-example" to your webspace location. After this your site should be available at the location you entered above. Now at least you should do a little bit for your security: In the actual state everyone can use the include/admin/admin.php file which administrates your website. So you have to protect the /include/admin subdirectory. The usual method is to place a .htaccess file in this subdirectory and to generate a password for it. There are other methods resulting in the same: you are asked for username and password when calling the administration website. If you have an account provided with a configuration system e.g. plesk or config-server, you probably will have a menu point "directory protection" to do this task. At A word on security you find more info on this topic. page is what you may expect: a module plain showing the content you've entered in "edit"
A page can contain pictures as usual, just upload them with the file upload in administration program and link them in the "files" subdir as they will be uploaded there. The content entered here is displayed in the "content" window, which you can customize in the style.css file in two ways: by changing the #content settings or by changing the settings for #page_[pagename] where pagename is the menu entry of your page, so this is page-specific. 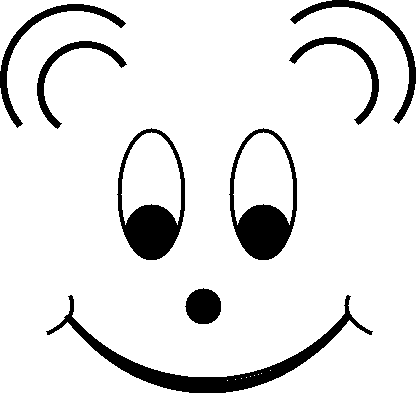 If you want to show a picture gallery use this. Editing the menu entry of a gallery lets you set a gallery title and upload picture files. You can even upload a zip-archive, so it's easyer to upload more pictures. But be aware of the maximum file size shown in the upload section of the administration program. Once you have uploaded pictures the admin program builds thumbnails for them and the gallery module shows some usual navigation symbols and the thumbnails to move through the pictures. Somehow special is the gear-wheel button starting (and by this changing to a switch-off button) a slide show of the gallery's pictures. The speed of the slide show is set in the admin config area (see below). The show restarts at the end of the gallery and as expected the switch-off button stops it. Below the pictures on the right side the filename is displayed, if it's a jpeg picture and the jpeg comment field is filled, the comment is displayed on the left side. If you are in the "direct edit" mode (see below) you can invite someone to your gallery by sending a mail to her/him. Below the pictures there is a text and a mailaddress field to fillout and a send button to press you will use to do so. First there is a Generate backup butoon. It does what you would expect: it generates a file "backup.zip" in the sites root containing all files in and below the sites root. You get a "download" button to download the file to your local system. And you can delete the file manually after that, if you want. This can be usefull, if you have limited webspace. which file extensions (the very last!) are allowed in file uploads (.zip is allowed for gallery picture upload without mentioning here, but only for galleries, if you want to allow it generally, do it here). Extensions have to be without "." and separated by comma. They include the appropriate UPPERCASE extension without naming it here. The direct-edit-Mode allows you to edit a page immediately without going over admin page. As for authentication proof you have to call once more the admin page after you set this to generate a security key. You see this by showing a "de_mode=" tag at the end of the link in the statusline of your browser. Set this to on if you want to activate. Every other setting but cke deactivates the feature. If activated, every "page" type page has an "Edit" button on the top right side. If you want another title for the menu block. This text is used to build the message to invite someone to one of your galleries. The time a picture is shown before changing to the next in milliseconds - the real time depends on your server too. A list of categories used by the special custom/tickeredit.php program, which is used to build an agenda ticker, see custom addons. The speed of the ticker rolling in ms per step. A value of 50 is usually ok. Right next to the entries are "action" buttons allowing to move the menu entry up- and downward, to save a change of the entry, to delete an entry and to edit the entry's content. means the page, where this entry should point to. This can be an internal type (page or gallery until now), so the name can be simply one word (good practice is to use small letters and numbers only), or just an external website, then you have to use the full syntax http://www.site.tld. External sites however can't be edited through the cms and the are shown in a blank window (tab) if the link is clicked. you have to select the before mentioned page type here, either page or "gallery" as internal types or the external link type. 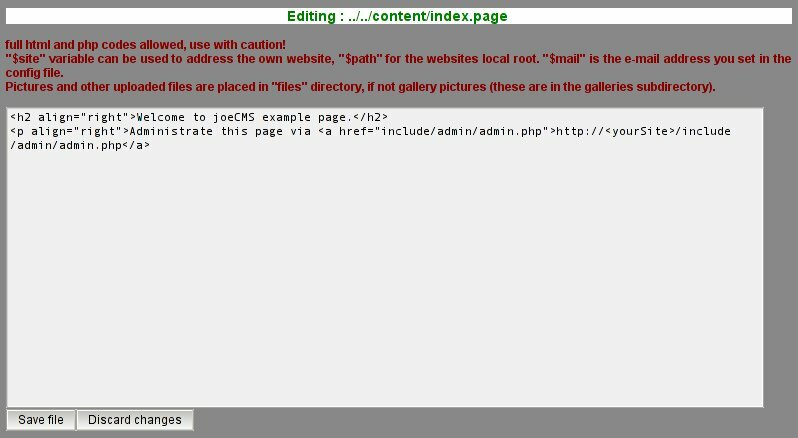 A "page" means one file will be generated by editing, a gallery is a subdirectory of pictures shown on a special (fullscreen) page. There may be more page types in the future. can be "0","1","2". "0" means, no menu entry visible. You can however link such a page or gallery by including an usual "a href"-link to it with ?s=menuentry for this menu entry. The goal of the invisible marking is, you can use the edit functions for invisible entries too. "1" means the menupoint will be shown at left, "2" means it will be shown indented as a submenu. The "+" and "-"-buttons do what you would expect, they just move the menu entry one line up- or downward. The "+5" and "-5"-buttons as well, but 5 lines at one jump. The "save" button saves your changes in the 4 menu fields. The "delete" button deletes the menu entry. You are asked for confirmation and have the possibility to delete the appropriate content too - if the content is a page, it is deleted, but not the pictures that are maybe shown by this page (see file deletion below therefore). If it is a gallery, the gallery title page and all gallery pictures, thumbnails and appropriate subdirectories are deleted! Below this you have 5 upload fields. Here the gallery pictures are uploaded. You can select upto 5 files a time to upload, reopen the "edit" page to upload more. But you may need this seldom because in addition to the named allowed picture formats (usual jpg, gif, png) zipped archives are allowed to upload. The must not contain any subdirectories and non allowed picture files, these are skipped when uploading. After uploading is finished it's checked whether thumbnail pictures exist for every gallery picture, otherwise the are created. 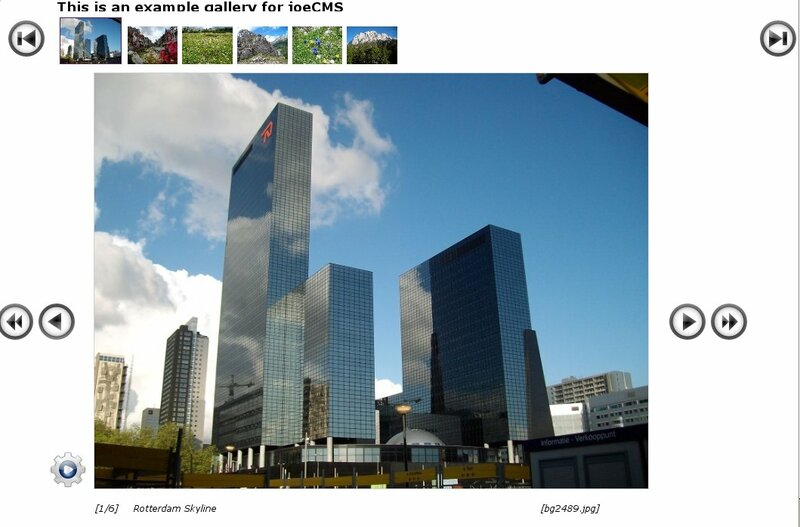 (Using thumbnails makes picture navigation much faster, especially on slow servers). If the exif data of your pictures contains the "jpg comment" tag, the text found here is displayed as picture description (you can generate this tag easyly with the linux command exiftran -i -c "description" picuture file , I chosed this because of really confusing use of the normal exif comment tags by most programs and digital cameras). Here you can upload single files (up to three a time) to the "files" directory. The allowed file extensions are shown, other files are skipped. The maximum file size of one file to upload is shown too, it depends on your servers setup. 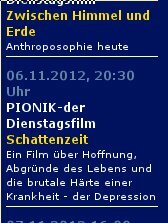 Just select with the file selector the files to upload and klick the "upload files"-button. This is for deleting single files out of the "files" directory or the galleries directories. The files in the "files" and in all gallery directories are shown in select windows, you can select more than one file (by shift+click or ctrl+click as ususal) in more than one directory. A general confirmation is asked (say "yes" or "no" to all!). A special thing is that you can include php codes here, the style.css is read by "include" php function. This is maybe useful if you want directory-independent local uri's, as in background-image:url(<?php echo $path; ?>/files/rainbow.gif); to include the background image in (maybe protected) subdirectories too. creates a sitemap.xml in the sites root. It uses Binny V. Abraham's sitemap generator script. You may want to customize it before first use (file: include/admin/create_sitemap.php) but it's mostly self-explaining, otherwise you get more info at Binny's website. After generating the sitemap.xml you can upload it to google, if you have an account. You find the file sitemap.xml in the root of your website. The code behind username is generated by htpasswd2 -n username (under linux) - you have to type twice a passwd and get the code back. (In fact, the above shown is the code for the password "test".) There should be a similar method for windows users. Often your web hoster has a admin module to do so, e.g. Plesk or config-server have. If you did manage this, everyone trying to enter this subdirectory will be asked for the username and the password. That shall be enough protection for most circumstances. The subdirectories files and content have to be writeable by owner, if owner is the same user as the visitor, otherwise they have to be world writeable. The same applies to the cms.config, cms.menu and styles.css files in the <YourSite>/include/admin directory. Therefore the above mentioned protection is really needed. If you upload page and gallery files or directories or other files placed in "files" by ftp they have to be writeable in the above way too to be handled by the cms. it's somehow strange to connect the gallery invitation with the direct_edit mode for page edititing, but was the simplest way because there is a administrator verification done for direct_edit. Maybe it will be better to create a more complex administrator authentication. page-admin mode (subadmin), a role with the right to edit existing pages via direct_edit? I'm not sure, whether it's a good idea starting to build custom addons. 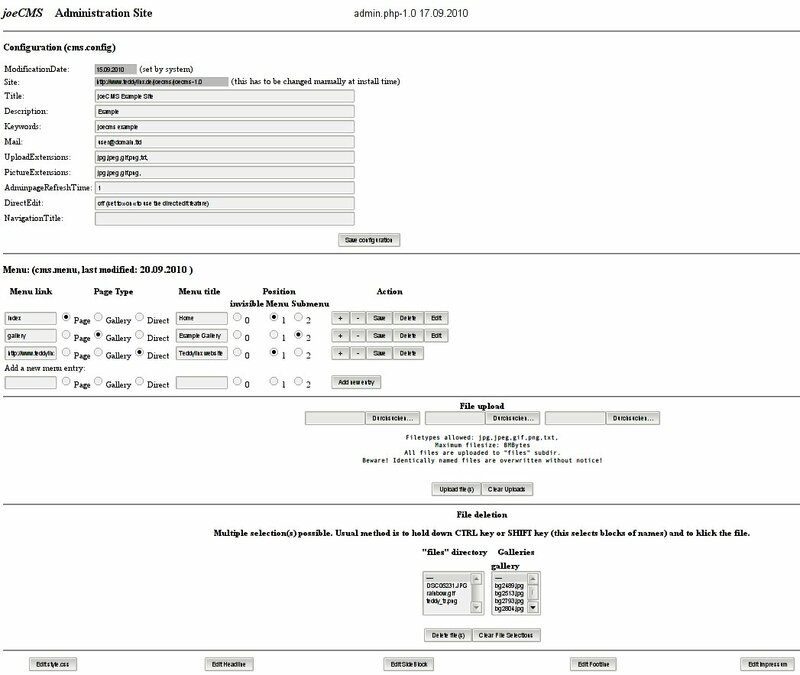 But there was the need for a structured agenda ticker editable by someone with nearly no html knowledge. So I wrote tickeredit.php which you find in the custom subdir. Maybe there will be more addons later or I will be integrating them into the main module structure. Time will show. The goal is to get an agenda ticker: structured with date, category, title, subtitle, maybe a picture and describing text (depending on the CSS style entries not all elements have to be shown, see right). So you enter these facts plainly. The data is not stored in a database but in a html page named ticker.page in the content subdir. The ticker module includes the content of this page for the rolling ticker but in addition you can show this page via the page module, simply add a menu entry for it in the administration programs menu section. As the elements are CSS styled you can easily customize both views, have a look into the styles.css therefore. The usage of tickeredit.php is self descripting. If you don't have a ticker.page yet there will be only one empty entry section to add your first event, otherwise you can both add a new and edit an existing event. Saving is done by the appropriate button, "reset all" resets all editing and "back" leads back to the ticker page, if any in the menu (otherwise the button has no target...). specially for this project: the admin.php uses the resize class by Shiege Iseng (shiegege_at_yahoo.com) to make the thumbnails with the php-gd module.